The multi-purpose New Bordeaux Stadium has a seating capacity of 42,000. Image courtesy of Relax40. 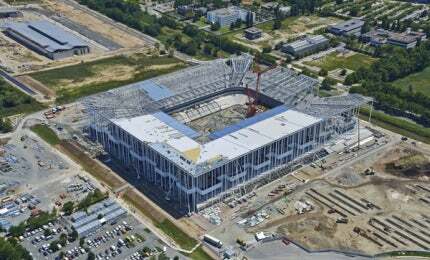 Designed by Herzog & de Meuron, it will host UEFA EURO 2016 football match. Image courtesy of ArcelorMittal. A large, white rectangular roof made up of steel cladding covers the stands. Image courtesy of ArcelorMittal. ArcelorMittal provided the steel beams, framework, floor decks and cladding for the New Bordeaux Stadium. Image courtesy of ArcelorMittal. Matmut Atlantique is a multi-purpose arena located in the Bordeaux-Lac district of Bordeaux, France. With a seating capacity of 42,000, it is one of the biggest sporting and cultural arenas in south-west France and will be one of the venues for the UEFA Euro 2016 football championship. In addition to the football games of Bordeaux’s resident team Girondins, the arena also hosts rugby matches, concerts and corporate events. The facility is designed by Herzog & de Meuron, the Swiss architects behind the Beijing National Stadium for the 2008 Olympic Games and the Allianz Arena in Munich. Stadium construction began in November 2012 and was officially opened on 18 May 2015. The total cost of design and assembly of the stadium was €183m ($228m). Stade Bordeaux Atlantique, a consortium comprising VINCI Construction France and Fayat Group, formed a public-private partnership (PPP) in July 2011 for the financing, design, construction, maintenance and operation of the new stadium until 2045. The 30-year long-term contract represents a total investment of €219m ($273m). "In addition to the football games of Bordeaux’s resident team Girondins, the arena also hosts rugby games, concerts and corporate events." Funding was mainly provided through a subsidy of €75m contributed by the state (€28m), the City of Bordeaux (€17m), the Aquitaine Region (€15m) and the Bordeaux Urban Community (€15m). The two consortium shareholders invested €10m in equity. FC Girondins de Bordeaux owner M6 group made an initial contribution of €20m and pays an annual rental of €3.8m for 30 years. Located between a manmade lake and the Garonne river in north Bordeaux, the new stadium covers 4.6ha and features a light and open structure. It is 233m-long, 210m-wide, 37m-high and consists of five levels. The key element of the design is a ‘bowl’ that surrounds the playing field. Consisting of two superposed levels, the bowl’s geometry and shape provide optimal visibility to all spectators. A large rectangular roof covers the bowl and allows sunlight to pass through. It has a 7° inward slope and a homogeneous white underside that is non-distracting to the spectators. Acoustic panels on the roof act as sound insulators. Both the roof and bowl are visually inseparable and are supported by a number of slender white columns, inspired by pines trees in the nearby Landes forest. These columns also create an aesthetic continuity with trees planted trees in the building’s east and west courtyards. The bowl rests on a plinth that includes VIP areas, private boxes and media areas next to the rooms dedicated to players. Large bay windows and an 8m-wide terrace offer a panoramic view of the playing field from the VIP areas. A stepped concourse encircles the playing field, providing views of the interior, the turf, exterior and surrounding landscape. It acts as a passageway between the field and exterior, and also connects two levels of the general public stands, allowing spectators to move freely without leaving the arena. Large staircases from the east and west courtyards provide access to food stalls, restrooms, shops and other services housed in the concourse. The New Bordeaux Stadium has the infrastructure to host several events such as motor sports, equestrian sports, skateboarding and biking. It can also be transformed into an entertainment venue for concerts, musicals, operas, art exhibitions and photo galleries. More than 37,000 covered seats are available for general spectators. Four elevators and 250 seats are reserved for people with limited mobility and their guides. The arena features a 200-seat conference room, a ground floor restaurant with seating for 200 people and meeting rooms to support seminars, conventions, conferences and other business events. The VIP area can host 4,400 guests, while the floor above can accommodate 980 people in 70 private boxes with their adjoining seats in the stands. The media area spans more than 1,150m² and is reserved for different teams covering the events and contains 366 seats. Other facilities include a press room, a mixed zone near the field and panoramic interview studios. More than 8,500 parking spaces are available including those for two wheelers and disabled people. The foundation work involved drilling of 945 piles into the ground to an average depth of 22m. The flooring consists of approximately 20,000m² of open-rib composite floor decks produced in Strasbourg, France, while the giant perforated roof was produced in Haironville, France. Built in 1950, the Maracana is an open-air stadium in Rio De Janeiro, Brazil. Audience seats are placed on 24km of bleachers and more than 3,600 steps were prefabricated in a concrete plant constructed on-site. The lightness of the building is attributed to the abundant use of steel, replacing traditional concrete. Steel has been used for the framework of the upper tier, the roof structure and most of the cladding, including all the roof supports and the underside of upper terraces. The east and west lower stands are built from concrete, while the north and south stands are made completely of steel. The steel structural framework was entirely built in France and weighs approximately 12,000t, which is double the weight of the Eiffel Tower. It includes 644 round steel columns, with the tallest being 37m. The steel cladding is covered with a zinc-magnesium-aluminium-based coating to resist corrosion. The stadium is equipped with photovoltaic panels and a rainwater recovery system to water the pitch. The turf is installed with AirFibr hybrid grass technology that is made of 100% natural turf anchored in an artificial rootzone. Groupe 6 was the executive architect for the project, while Michel Desvigne was the landscape designer. Cabinet Jaillet-Rouby and Structures Ile de France were structural engineers for the project. Elioth performed energy and environmental engineering, and also monitored the environmental performance during construction. Egis group provided MEP, HVAC engineering and technical fluids engineering services. Ingerop was responsible for the civil engineering works, while IdB Acoustique was the consultant for the stadium acoustics. Natural Grass provided the turf for the playing field. VINCI Facilities is responsible for the upkeep and maintenance of the new stadium. ATE was the pitch consultant, while Mazet & Associates was the quantity surveyor. ArcelorMittal supplied 4,200t of steel beams manufactured in its mills in Luxembourg and Spain, with 500t of tubes also produced in Spain for the steel framework. In addition, the company supplied steel for the giant canopy, floor decks and cladding. ArcelorMittal is one of the world's leading integrated steel and mining companies. It is one of the leaders in all major global steel markets, including automotive, household appliances, packaging and construction, which is one of the most important segments for steel applications.